The interest of the composer Philip Glass in Gandhi dates back to his first visit to India in 1966. 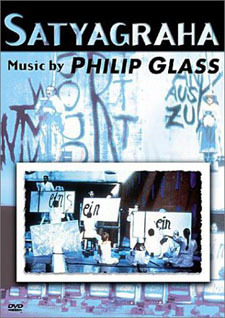 In composing his second opera, Glass did not want to paint a historical portrait of Mahatma Gandhi. Instead, his intention was to use Gandhi’s involvement in South Africa in the years between 1893 and 1914 as an outline of current global political and religious problems. In South Africa, Gandhi formulated his thesis of passive resistance and civil disobedience known as “Satyagraha” or “dedication to the truth” as a reaction to discriminatory governmental measures aimed against the Indian portion of the population, such as the deprivation of voting rights. Glass and Constance de Jong put together the libretto based on the ancient Indian didactic poem Bhagavadgita (the “Song of the Blessed One” dating back to the 4th/3rd century B.C. ), which Gandhi often quoted, and Gandhi’s biography. There is no plot; the audience is only given a vague sense of the historical facts which are overlaid by philosophical and political statements, interjected parables and the recital of the sacred Sanskrit text. The opera, a product of the rebellious spirit of the late sixties and the step forward towards a multicultural and multireligious society, was commissioned by the City of Rotterdam and performed there as a production of the Nederlands Opera. The performance went on tour and was also staged in New York. However, the ingeniously illustrated Stuttgart production by Achim Freyer in 1981 set all new standards. It was part of a Glass trilogy shown there in 1990 with Einstein on the Beach and the opera Akhnaten, which had its grand premiere in Stuttgart. All of these works were performed under the musical direction of Dennis Russell Davies. In the scope of a traditional orchestra, Glass used a large string section for the first time in Satyagraha. His typically repetitive musical structures impart the music with a unique, definitely non-illustrative dimension and mirror the rhythm and melody of Hindu prayers. Libretto by Philip Glass and Constance De Jong. Live recording from the Württembergisches Staatstheater Stuttgart, Großes Haus. Conducted by Dennis Russell Davis. Based on an original scenario by Philip Glass and Constance De Jong. Set and Costumes Designed by Achim Freyer. Executive Producer and Audio Director: Joachim Augustin. Video Editing: Heidi Bohm, Klaus Oetzel, Holger Wieland. Camera: Michael Donecker, Bernd Udo Herzmann, Henning Juhl, Gisela Loew, Gunter Mohn. Cast of Characters: Gandhi 1: Leo Goeke. Gandhi 2: Ralf Harster. Gandhi 3: Helmut Danninger. Schlesen, Ghandi’S Secretary: Inga Nielsen. Kasturbai, Gandhi’S Wife: Elke Estlinbaum. European Aides: Wolfgang Probst, Kimmo Lappalainen. Indian Aides: Daniel Bonilla, Melinda Liebermann. Mrs. Alexander, Wife Of The Chief Of Police: Helga Merkl-Freivogel. Krishna: Karl-Friedrich Dürr. Arjuna: Helmut Holzapfel. Tolstoy, Tagore: Georg Greiwe. Dancer: Annette Holoch. Bathers: Thorsten Kreissig, Annette Holoch. Child Playing with Ball: Harry Brandel. Barkeeper: Klaus Schultheiss. Publisher and Sole Agent: Dunvagen Music Publishers Inc. Copyright Dunvagen Music Publishers, Inc.
A ZDF-RM ARTS Co-Production in association with Channel Four Television, U. K. Licensed worldwide by RM Associates.